Many experts assert that battery cage farming is extremely cruel, and studies have shown that battery cage eggs are less nutritious than free-range eggs. The space provided to hens in battery cages is not sufficient for them to stand upright, turn around, stretch, flap their wings, lie down, groom themselves, build nests, engage in litter bathing, or fulfil normal social urges. Unsurprisingly, hens living in such conditions suffer poor physical and mental health, and the eggs they produce are less nutritious.Battery cages are being phased out in Europe and parts of the U.S. in favour of more humane methods, but Canada and many areas of the United States are lagging in making the shift. However, a recent Harris/Decima poll found that 72% of Canadians would pay more for humane food, and 63% support a complete ban on battery cages (Vancouver Humane Society, 2009). Dr. John Webster of the University of Bristol’s Department of Clinical Veterinary Science agrees that the severe restrictions imposed on the mobility of hens causes “injuries to feet and feathers, and exacerbates the development of osteoporosis, leading to bone fractures and chronic pain.” The Canadian Coalition for Farm Animals cites a variety of studies indicating that 80-89% of battery hens suffer from osteoporosis. Other physical problems associated with battery cages include metabolic and respiratory diseases, painful foot lesions, and slow death via starvation and paralysis due to spinal compression. 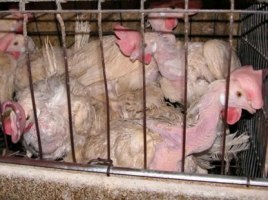 In addition, battery cage hens are often deliberately starved to increase egg production, a process called forced molting. The practice further increases the risk of bone breakage and death, according to the Canadian Coalition for Farm Animals. Dr. Baxter asserts that in the barren, cramped space of a battery cage, hens suffer “a chronic state of social stress, perpetually trying to get away from their cage-mates…” Dr. R.B. Jones of the Roslin Institute’s Welfare Biology Group agrees, noting that “Rearing chickens in impoverished environments leads to apathy, boredom, fear, and abnormal, often harmful behaviours.” For example, battery hens regularly pluck one another’s feathers out, sometimes creating open wounds, and some even engage in acts of cannibalism. Because they cannot escape from one another, portions of their beaks are sliced or lasered off to prevent these frustration attacks, leading to chronic pain. A number of studies conducted over the years have shown that eggs laid by chickens with access to outdoor pasture are more nutritious (see Nutrition: Free Range Eggs vs. Battery Cage Eggs for more information). The Vancouver Humane Society’s Chicken OUT! website provides information on battery farming, lists of cage-free companies and restaurants in the Greater Vancouver area, news about Canadian and U.S. companies that have gone cage-free, ways to help local businesses make the shift to cage-free eggs, and tasty egg-free recipes. Additional information on battery cages, current campaigns, and resources can be found on the Canadian Coalition for Farm Animals website. For a guide to interpreting confusing egg claims and certifications, see Egg Labels. For more food and drink articles, see the main Nutrition and Food page. Canadian Coalition for Farm Animals. (n.d.). “The Truth About Battery Cages and “Facts About Our Food – Battery Hens”; (October 2005). “Battery Cages and the Welfare of Hens in Canada: A Summary of the Scientific Literature.” HumaneFood.ca. Schmidt, S. (2009). “Cracking Egg Labels.” Natural Health, October 2009, FindArticles.com. The Humane Society of the United States. (n.d.). “Synopsis of Expert Opinions on Battery Cages and Hen Welfare.” HumaneSociety.org. Vancouver Humane Society. (28 December 2009). “Results Suggest Majority of Canadians Want 2010 to Be Happier for Hens.” ChickenOut.ca.